Spotlight On Spices! Issue November 2015 Rev- Ajwain or Ajowan Great for Vegetarian Meals! Oops! This Revision corrects some broken links (e.g., "Soulful Chili Soup" recipe) found in the original. Sorry for any inconvenience! Goddaughter Lauren continues to travel the world (so far this year France, Austria, Belgium, Netherlands, Italy, Germany, Hungary, Prague) and educate herself on how its global economy works and how its foods taste. 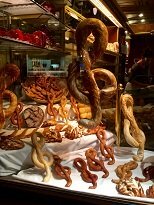 I’m sharing one of her "good eats" photos - treble clef pretzels she enjoyed in Vienna. She also enjoyed decadent desserts and pastries in Austria, and raved about a warming goulash she treated herself to in Budapest. Meanwhile, I’m trying to get into a mindset of accepting that winter is just around my corner, and perhaps yours too. Again, another year that has gone by much too quickly -- I’m nowhere near ready for the winter elements of ice, sleet and snow. Brrr!!! However, when the weather gets chilly I start again to make big one-pot meals -- soups, stew and casseroles that can be served alone with a chunk of wholesome bread like Miche, Spelt, Cracked Wheat, Multigrain, or with a side salad. 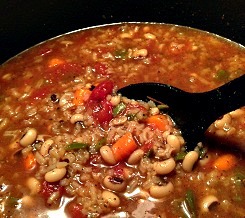 Pictured below is a pot of deliciousness I named "Soulful Chili Soup" because it is stocked with black-eye peas, rice, green bell pepper, tomatoes, onions, carrots, and flavored with ancho chile powder, roasted garlic, black pepper, olive oil, rosemary, bay leaf, and this month’s . . . . . . THE SPICE OF LIFE - Ajwain or Ajowan Great for Vegetarian Meals! 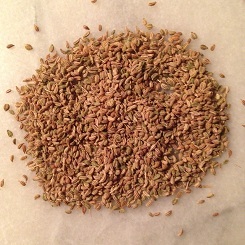 Shaped like a celery seed, Ajwain or Ajowan is related to Caraway, Cumin, and Dill. Ajowan seeds are from an annual herb which is indigenous to India where they are used heavily for vegetarian meals, especially those prepared in that country’s southern regions. This dish is robust and flavorful! Its look reminds you of traditional chili, however, it has Black-eye Peas instead of Kidney, Black, Navy or Pinto Beans, and there's no Cumin or Cilantro. Plus, you probably wouldn’t top it off with shredded cheese. The Ajowan seeds add a smoky peppery taste and they work as a carminative (helps ease gastro intestinal gases which may result from eating beans and lentils).